The actor Ichikawa Danzô VI held the name of Ichikawa Hakuzô I from 1831 to the 10th lunar month of 1835. The actor Ichikawa Danzô VII held the name of Ichikawa Hakuzô II from the 11th lunar month of 1847 to the 7th lunar month of 1854. Born in Tôkyô the 5th of January 1901. He was the son of Ichikawa Shôen, a disciple of Ichikawa Danzô VII. He started his career as a disciple of Ichikawa Danzô VII and his first stage name was Ichikawa Mikamatsu. He made his debut on stage in May 1905 at the Hongôza. He became nadai and celebrated the event in May 1935 at the Meijiza, where he took the name of Ichikawa Monzaburô III. He performed for a while with his master's son Ichikawa Kuzô IV or Nakamura Kichiemon I. Then, he left in 1944 the main theaters to perform in koshibai in Tôkyô, Kawasaki or Yokohama. He joined the Katabamiza troupe after WWII and became a movie actor. He was back in ôshibai in 1963. He took the name of Ichikawa Hakuzô III in April 1966 at the Kabukiza, playing the role of Ichihara Dampei in the "Banshû Shoshazan" scene of the drama "Kiichi Hôgen Sanryaku no Maki" which was staged to commemorate the last stage appearance of Ichikawa Danzô VIII. 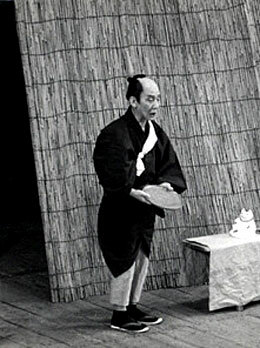 He appeared on stage in June 1974, in Tôkyô at the Shinbashi Enbujô, where he performed in "Terakoya", "Abura no Jigoku" and "Ohama Goten". He died the 13th of September 1974.